The sides of this hairstyle is tapered into the head with subtle layers through the top styled over to the side for a chic look and feel. The back is cut short close to the nape while the bangs are combed to the side to soften the face and completes the over-all 'do brilliantly. Product is needed to keep this hairstyle in place. Our model looks beautiful here in a sleek short hairstyle that brings her gorgeous facial features into the spotlight. She suits short hair well, due to her inverted triangular face shape and high cheekbones. She also looks great in styles with grown out or side-swept bangs thanks to her short, wide forehead. The tapered sides and back in this cut show off her face nicely, while the sleek finish brings the focus up to her eyes. This â€˜do works well with her hair type, which is fine and straight, and looks best in cuts that are styled with precision.The fringe sits softly to the side creating a feminine finish. As for her color, our model has a fair, cool complexion, blue eyes and naturally light blonde hair. Here she lightens up her locks further by going to a platinum blonde tone that looks fabulous with her complexion. This color adds extra style to her simple 'do and is guaranteed to turn heads wherever she goes. It also adds the appearance of thickness to her fine hair. 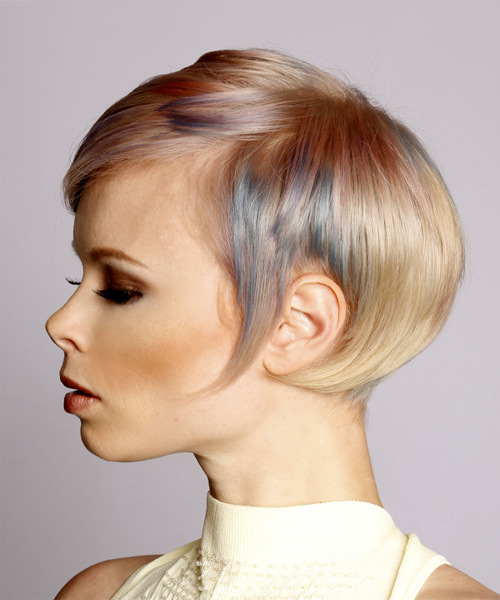 To add a final dose of style, her hair has been highlighted with baby pink and low lighted with a soft blue tone. This gives her 'do an overall sweet yet edgy finish. Use a round brush to add volume to the top layers when blow-drying.